During the past week on Mars, dust hazes and dust clouds were observed over northern Utopia, just west of the Olympia dune field. Looking to the low latitudes, the aphelion cloud belt proceeded to dominate the skies with condensate water-ice clouds strewn from Elysium to Tharsis, as well as above all the major shield volcanoes. 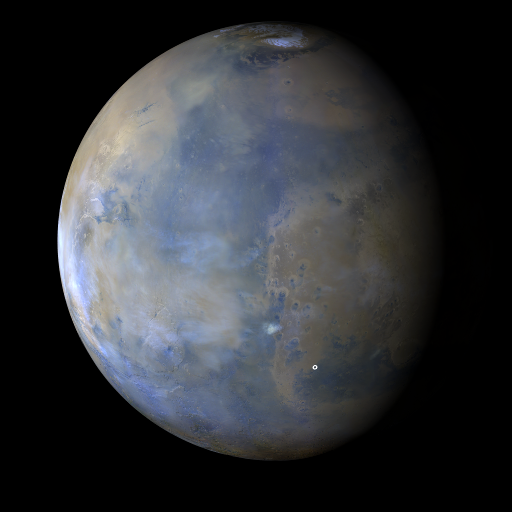 Sporadic short-lived dust storms were spotted east and west of the Opportunity rover site. In spite of those dust events, both the Opportunity rover in Endeavour Crater and the Curiosity rover in Gale Crater explored under storm-free skies throughout the week. Malin, M. C., B. A. Cantor, A. W. Britton (2017), MRO MARCI Weather Report for the week of 27 November 2017 – 3 December 2017, Malin Space Science Systems Captioned Image Release, MSSS-507, http://www.msss.com/msss_images/2017/12/06/.